In Class 1 we use a lot of visual stimulation to encourage the children with their thinking ‘outside the box’ as well as talking partners. Visual Literacy is a different way of teaching Literacy within education. It has been suggested that the implementation of Visual Literacy has been introduced to enhance children’s imagination, to interpret and understand images and visual media as well as to promote reading. Children see images differently to others, therefore their interpretation is different to the interpretation of you or I. The philosophy behind Visual Literacy ensures that the teaching of literacy is exciting and supports current ways of teaching literacy. The children can see the link between stories, films and writing. Being able to plan each lesson accordingly is essential to ensuring that effective teaching takes place which in turn provides a positive and enjoyable learning environment that ‘is key to making children’s learning positive, exciting, varied and progressive’. It has been suggested that children as young as three and four have learned to read through the media such as television, films and DVD’s. Working with these images it has been suggested encourages reading and writing. By being able to talk about their experiences relating to their favourite television programme or film enhances the children’s learning and encourages them to learn. This also echoes the thought of Pie Corbett as he considers that having a story told and retold does not just improve writing but aids in the development of language and communication skills. In 2003 a small research project was carried out in Kensington as to whether visual literacy enhanced children’s learning. At the end of this research the staff noted that many of the children who participated found their writing had improved and their literacy skills had also made significant gains. There have been parental concerns regarding the introduction of Visual Literacy; in 1997 parents were suggesting their children’s reading and writing would suffer. However research by CfBT Educational Trust and the British Film Industry has shown this is not the case, as they suggest children are able to draw on connections between film and written words, which in turn will lead to children who are more confident readers and writers. During Visual Literacy/Numeracy and Topic Lessons we also work with partners - Talking Partners. Using Talking Partners ensures quality talk in the classroom. The main change in the classroom is who is doing the talking. Traditional classrooms is teacher talking to class or individuals and often many teachers usually have a question and response session as part of their lessons; whilst this provides opportunity for individual children to respond, using ‘talk partners’ means that there is no opportunity for children to opt out while the confident few do most of the talking and thinking. Many of us are guilty of asking a question and waiting for the children to think and answer through raising their hands. However research has shown that it is the same few children who are always first with their hands up and do most of the answering, therefore most of the class opts out of listening and thinking as a consequence. I have therefore introduced within my classroom a no hands up policy. 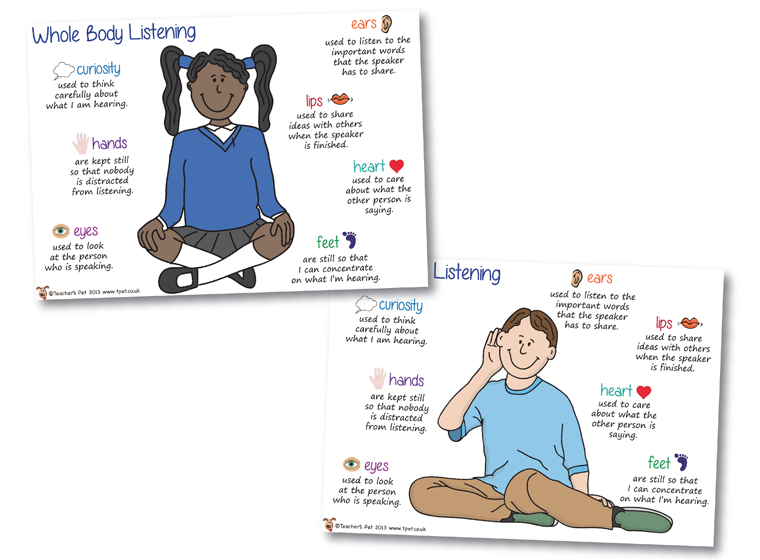 The use of talk partners means there is a constant handover to the children when questions are asked or tasks are underway. Children are immediately more motivated to work because they are in charge of their own learning. Some children feel more confident when using talk partners because they don’t feel any pressure as they are part of a paired response and there is time to discuss. Children begin to give more detailed answers and gradually develop higher quality talk. So if your child comes home and says we've been watching DVD's and talking then they have also been learning! Let them talk about what they have watched, let them tell you about their talking as they may have seen or heard something you haven't!